Triangle Farms is a 6th generation family farm. We have gone through many changes to survive over the years. The farm is versatile in the crops that can be grown due to its location. 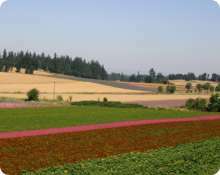 We are located in the foothills of the Cascade Mountains on the Northeast side of the Willamette Valley. Our growing areas extend from Mt. Angel to the Silver Creek Falls, which gives us an elevation change of 300′ to 1700′ with some irrigation. The crops we grow include flowers, grass, forbs, vegetables, herbs, and specialty grains for seed. With our own modern, state of the art “seed-processing” facility we are able to process our own seeds. Triangle Farms also processes seed for other local growers and companies. On our steeper acreage, it is more difficult to farm row crops so, we specialize in raising Noble Fir Christmas trees. The remainder of our ground is re-planted into timber and is also used to raise meat goats on. With several thousand acres and a large investment in equipment, we are able to accommodate a multitude of projects. We also have worked with some bare root production that is in its trial stages. Triangle Farms continues to farm in environmentally friendly ways. This will produce safe products for the consumer without the spread of disease and unwanted pests. Our farm uses its best efforts to make sure the products we produce are of the highest quality. We believe that we can directly offer some of the best services available. Our company forms long lasting relationships with our customers founded on communication and trust. As you can see Triangle Farms is a very diversified farm. We have very good staff that has supported our goals and efforts over the years. Our employees have learned what it takes to perform the tasks needed to maintain and improve the quality of service that we demand for the fine products we produce. Check out the rest of our site and if there is something we can help you with or you have questions about, please contact us! 1902 The Loe family farm was purchased in 1902 by Ole Loe, our great, great grandfather, who originally came from Norway in 1869. He moved to Wabasha county Minnesota until 1901 when he moved to Oregon. He bought this farm from Coolidge and McClaine and other parcels from Gilbert Evens. This is where the name of the valley – Evens Valley came from – which is the area we live. In the early days they raised hops until the 1920’s when they then switched to more typical crops, such as chickens, cows, grain, hay, fruits, and berries. 1924 In January of 1924 Ole Loe died and the farm was divided between his three children. Two of his children Emil and Ida went into other occupations and the third child Oscar, our great grandfather, stayed on the farm and continued the tradition. December of 1924 Oscar and his wife Marie Westby moved into the old hop-picker’s which is the farm house where our seed processing facility is located. It was also used for the schoolhouse before the school was built for Evens Valley. They had three children: Kathryn, Roger and Mary. 1934 Oscar worked at tree grafting, he raised nursery stock, turkeys and chickens and did custom harvesting in the 30’s. However, he then realized that in order to survive, he had to do something different than what every other farmer was doing. He had a friend at Oregon State College named Harry Schoth who was an agronomist. In 1934 Harry introduced Oscar to Alta Tall Fescue – this is how we got started in the grass seed industry. From this point on, they started growing different grasses and forbs. 1939 Oscar built a warehouse and seed plant to process these products on site – one of the very few buildings to be built specifically for seed processing in the Willamette Valley at the time. 1948 Oscar went to Europe in search of new crops; in France, he tried to see if he could get Charolais cattle. Charolais cattle were quarantined from entering the U.S. directly so they were not allowed to buy cattle. He ended up going to Texas and buying Charbray cattle; eventually, he upgraded to a Charolais bull through Canada. Oscar also raised a lot of horses; he worked with the Arab and Welsh breeds which at one time numbered well over 100 horses. When he was in Europe, he brought back a new variety of clover from Denmark, and Burnet, an herb from England. 1952 A Dryer and Grain Elevator were built. This facility was used for adding field corn in their crop rotations. This was one of the few driers and elevators built in the valley with the design that remains today. 1964 When Oscar died in 1964 his son Roger Loe managed operations. Roger’s main enterprises were with the Charolais cattle and the Fine Fescue. The large number of horses was replaced with almost 500 Charolais cattle, and most of the tillable ground was planted in Fine Fescue. The several farms he had acquired were left over the years to his wife and children. As of today most are still owned by the family. 1978 Kevin Loe started farming his own ground while working for his father Roger Loe. 1981 caused many changes as low cattle prices and a burning ban were forcing a change on many years of working with cattle and Fine Fescue. The cattle prices and burning ban put large economic pressure on the farm for changes. Kevin Loe started growing flowers and vegetables for seed as an alternative. 1983 Roger and Patricia Loe had five children: Greg, Ruthie, Kevin, Laurie and Wendy over the years. Kevin, who had worked on the farm from a very young age, started to purchase the farm and take it another direction. He knew that in order to succeed he would need to make major changes and he began looking into many different crops that most other farms did not produce. Going in this direction would give a value above most crops, due to the high risk of production. Learning how to produce and process these crops became a challenge that would be well worthwhile. 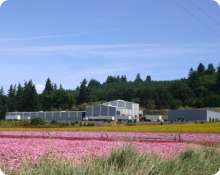 1991 Triangle Farms, Inc. was created as a separate business for processing seed for other growers. From 1983, we had grown to where we needed to treat this as a separate business. 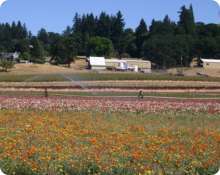 A facility was leased from Sunseeds in Brooks, OR where we processed specialty seeds and such as flower, vegetable, vine and many other seeds. 1992 Our home seed plant we used for cleaning grass seed that was built in 1939 was destroyed in a fire. 1994 We started to rebuild the facility with 3 complete seed processing lines to process all of the diverse seeds that we might produce or that other growers produced in our area. 1998 Most of the cattle were sold and 150 goats were purchased from Texas.  We changed the operating name of the whole farm to Triangle Farms, Inc. because we felt it represented our farm better. 1999 We began Native seed collections and propagation of domestic seeds of our own varieties. 2000-Current Angela Rose, our daughter, started Oregon Wholesale Seed Company in 2000 to market seed that we and others produce on the wholesale markets. She also markets the production services of this farm and selected farms for seed production. Angela, at the same time started Silver Falls Seed Company which offers seed that is produced on our farm, and a few others, directly to the consumer and to retailers in an attractive ready to use package. This company also uses this as an educational tool to teach about agriculture. She offers the Silver Falls labeled seed as well as custom labeled seed for whatever occasion or business in smaller quantities than most companies offer. She is married and has two daughters and a son. Travis Loe is our youngest and is currently working on our farm. He attended Linn Benton Community College for Diesel Mechanics. Melissa Gengler, our 2nd daughter, graduated in December 2004 from Linfield Nursing School. She is married and works as a registered nurse at Silverton Hospital. 6 Generations on this farm and over 100 years of success!